Click the links on the right to jump to sections. SpringSharp 3 is a major, major, major rewrite of Springsharp. Major structural changes, whilst invisible, have been made - 80% of the code has been changed or replaced. Even this underestimates the effort put into this update. Research and experimentation has taken up a lot of the time since the last release. Given how long it has been since the last update and how much work has been done we thought it was necessary to release the first beta now and as widely as possible rather than use the closed beta testing of the last update. If you trial this Beta - Please send me copies of ships that you have developed with it, especially real world ships. If you find problems or find bugs please bear in mind that this is a beta and an early beta. THERE WILL BE MANY BUGS WITH THIS PROGRAM. Please do not just criticise, send us your problems, comments and recommendations (and what you like about it) to rossgowan@optusnet.com.au. Changes in this version include a far more modular structure - which has greatly shrunk the program and improved it's speed especially on Vista with a Pentium 4. Most outstanding features are now enabled. We have left the previous beta online because of the major structural and framework change. Please advise of any instabilities or problems with this initial release of this beta. Once these are found and resolved a stable version of beta 3 will be released (with a change log). Allows selection of different armour deck layout options instead of requiring entry of average armour thickness over all waterline area. These include allowing for different thicknesses (including no armour) over the forecastle and quarterdeck or protection for just the engines and/or magazines. Weight calculation responds to armour deck layout choices. Weapon event handlers enabling the second bank of torpedoes (Mines and ASW weapons to follow. Clickable text panels replaced by buttons. These buttons cover the unselected optional entry boxes for entering overall length instead of waterline length, Normal Displacement instead of Block coefficient shell weight in Kg instead of lbs. Clicking on the button selects the alternative and moves the button to cover the original selection. Text on the button shows the alternative's current value. The button for switching between entering shell weight by Kg or lbs also allows for the shell weight to be locked so that the shell weight does not recalculate whenever a related input changes (eg Calibre length, date etc). It still does the integrity check in case the shell weight is far too light or heavy. Allows entry of non-armour / non-structural void or bulge weight (included in misc weight). For example the weight of all the pipes inside the HMS Hood's bulge. The hull depth (freeboard + draught) can be locked so that modifications that change the draught will also change the freeboard. Allows entries for 2nd torpedo, mines and ASW weapons, weight calculations for the last two coming. Allows entry for a 2nd Control Tower and adds its weight to the total CT weight. Calculates different effects for small vs. large transom sterns. 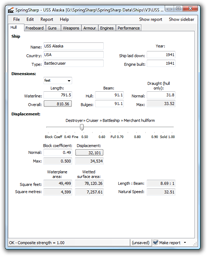 Calculates different waterplane areas for small vs. large transom sterns. Torpedo mount deck area or hull space based on location in drop down list. SpringStyle calculations replaced by actual size based on calibre and length. Torpedo weights estimated from calibre, length and date. The effect of a transom stern has been temporarily fixed so that it increases fuel consumption below 20 knots and improves it above. It currently uses a fixed effect above 25 knots and below 15 knots with a linear transition between 15 and 25 knots. This will be replaced by the Holtrop-Mennan resistance model later. Gun descriptions in reports are on whole identical to text in drop down selection boxes. Changing the number of gun mounts now updates the layout description of Gun Group 2 if necessary. Improved object orientation for the gun control. This has temporarily reduced the feedback through the status bar, which will return in 3.0b3. The error in the shell weight where the weight in lbs was the same as in kg in 3.0b1 has been corrected. The engine choice checkbox error and description error have both been fixed. A single screw hull has a waterplane area that is always less than or equal to a multi screw hull at the same block coefficient. Bulkhead width formula improved by being based on Waterplane area coefficient improving belt weight calculations and allowing for forecastle and quarter deck armour deck weight calculations. Bulge armour weight now calculated. Stability calculation takes into account miscellaneous weight below the waterline (in vital space, voids and bulges. Creates Armament title in report when there are no guns if there are torpedoes. Corrected the weight of guns in the 5th battery borne by the hull to match the calculation for the other 4 batteries. Weight distribution table adds up to Normal displacement and 100% again. R. Watton, Anatomny of the Ship, The Battleship Warspite.